Russell said: "I've got four children and one on the way, and my son, Finn, who is three, is obsessed with Tiger Roll. He thinks this is so easy, because he's watched two Grand Nationals in his life and I've won both of them on Tiger Roll." One of the few moments of concern for Russell came before the race when Tiger Roll dug his toes in on the way to the start. He said: "I don't know what got into his head - he just got a little bit 'antsy' with himself. If he doesn't want to do something he won't, and he got a bit silly back at the start. Denis Regan came up and gave him a lead and he was fine when he was back among the others. For a moment, I was worried I wouldn't get a good position when they lined up. "[In the race] He travelled really well and at times I thought he was overdoing it, but he jumped so well and is so quick. I just kept getting him back because he was passing horses in the air. He's a spectacular horse, an athlete, and he loves to run and jump. "Keith Donoghue [who won the Glenfarclas Chase on Tiger Roll at the Cheltenham Festival] has spent a lot of time on Tiger Roll's jumping and I think that's why he has won two Grand Nationals. When he started chasing he used to be a bit of a bulldozer at the fences, but since he started jumping cross country fences he's learned to be a bit more nimble. "It was helter-skelter over the first couple of fences and got a bit tight at times - to be honest I can't remember much about it - and I was chopped for a bit of room going down to the Canal Turn first time. I didn't want to get into a row with anybody at that stage, because I knew that when we came to a jump and if he met it on a stride he would get by them. "It's unbelievable for me, because Presenting Percy [who he rides] has a very good following in Ireland, but people who have never seen a horse in their life know Tiger Roll. The people adore him - he's not a big, fine, good-looking horse, but at home people walk past his stable and say hello to him as if he's a human being. It's just unreal. "I know it's silly, but I believe he knows his name. Going to the start, when we were parading, the commentator said his name and he stood up and put his chest out. Louise who was leading him up noticed it, too. He's so intelligent." 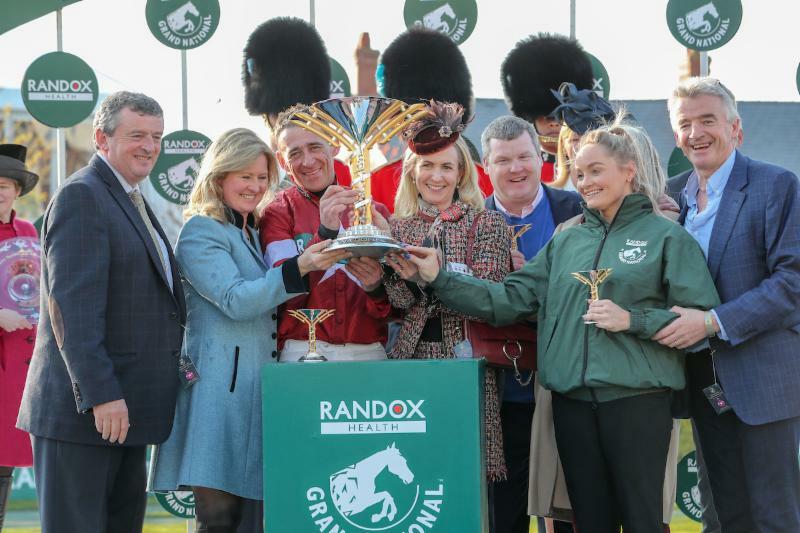 After receiving his prize as winning trainer of the 2019 £1-million Randox Health Grand National - his third success in the race - Gordon Elliott talked further about Tiger Roll, who has followed up his 2018 victory with a two and three-quarter length defeat of 66/1 chance Magic Of Light and justified 4/1 favouritism in the world's greatest race. Elliott said: "It's unbelievable. We had 11 runners in the race. When Silver Birch won [in 2007], I probably didn't appreciate it enough, and when Tiger Roll won last year it was unbelievable. This year, if any of the 11 horses had won, it would have been great, but Tiger is a bit special. The stats were against him, and we were hoping and wishing and praying he could win, but I thought it was probably impossible, so for him to do it... Hopefully he will now get the recognition he deserves and go down as one of the greats. "Michael [O'Leary, the winning owner] has two statues in his house, of War Of Attrition and Don Cossack [his Cheltenham Gold Cup winners] and he said he wasn't about to put one up for this lad. If he doesn't, I hope he stuffs him and keeps him! "You are always hopeful more than confident. To be 7/2 or 4/1 to win it is lunacy. You'd want to be 10/1 to jump round, never mind win the race. Tiger wears his heart on his sleeve, he takes a chance at everything. He wants it more than anything. He's a bit special. Tiger Roll's a gentleman. He doesn't do anything fancy - he just wants to please you the whole time. He is the horse of a lifetime, I suppose. "Everyone who knows me knows I am easy enough going, and I would have been very happy if any of my horses had won, but Tiger is a bit special. My uncle passed away this year and if it hadn't been for him, I wouldn't even know what a horse was. He used to ride in point to points and had a few horses when I was a young lad. He will be looking down on me. My mum and dad are at home; I don't have a flight home, but I'd ask Michael if he has a seat on the plane because I'd like to go home tonight to see my mother and father. "You talk about legends. Tiger Roll has won two Grand Nationals and four races at the Cheltenham Festival [2014 G1 Triumph Hurdle, 2017 G2 National Hunt Chase, 2018 and 2019 Cross Country Chase] - he's already a legend for me." Elliott admitted that when Tiger Roll turned up in his yard in the winter of 2013/2014, he wasn't overly impressed with the little horse. He said: "I wasn't the number one trainer for Gigginstown, and there was a horse that I had recommended they buy and that I wanted. It went to another trainer, and that was probably the first and last time Michael and I had cross words - I threw my toys out of the pram a bit. Michael said, 'enough's enough, don't say anything more about it.' I got two horses, one of which won a race or two, and the other was Tiger Roll. The horse I wanted ended up being no good. If you don't have luck on your side, you have nothing. The rest is history." Owner Michael O'Leary commented: "It's just unbelievable. I thought that he genuinely had no chance today carrying that weight but it was a beautiful ride and a phenomenal training performance by Gordon. It's brilliant he keeps bringing this horse back to Cheltenham better than ever and Aintree better than ever. What a ride by Davy - fantastic! "Tiger Roll has got a stage now where you just want to mind him. You run the risk every time he runs, you think 'Oh my Gold, please don't let anything happen to him' and it is unbelievable to win two Grand Nationals. It's incredible. It's a great result for the punters, it's fantastic." His brother Eddie O'Leary, who manages Gigginstown House Stud's horses, said: "He is now a superstar. It's unbelievable and I am so thrilled for everyone, for Gordon and the lads, he is a special horse. He was bought for the Fred Winter! He is a marvellous horse and God bless him." 39-year-old Davy Russell remarked: "I can't believe it! At my age now, to win two Grand Nationals - it's madness! He's one hell of a horse. The O'Learys have been so good to me throughout my career and Gordon. What can I say? "This horse is amazing and this place is amazing. People go one about certain sporting events but Liverpool and Aintree are just so far ahead. People come here in their droves to cheer on such a fantastic event and they can be so proud of what they have, it's so well run. It touches so many people around the world and I am so proud to be part of it. I can't believe it, I really can't. "Tommy Stack is a Tipperary man and I was in awe of Tommy Stack - I still am, he's a marvellous man and I love spending time with him for the simple reason of this race. "Myself and Gordon have soldiered a long way and dad is here today. I asked him if he had ever been to Aintree before and he said years ago. He booked his flight and hotel on Wednesday morning and said he was coming and that was it. It's a marvellous thing. "It was easy on Tiger Roll because he barely gets over the fences, he just flicks across the top of them. At times, you are thinking 'Jesus, he wants to lift his legs a little bit' but I can't believe it, I really can't." Gordon Elliott declared: "What a horse! What a horse! This is up there because we work very hard for this the whole time. I have a brilliant team behind me - my family are all at home. Davy Russell's mother died last year, so this is for her today. My uncle died this year and I wouldn't be in horses if it wasn't for him and this is for him. "He is unbelievable, the horse of a lifetime. For all my friends, for my family, my mother, my father, my brother and three sisters, and everyone in yard, from my head man Simon McGonagle to the last person who came to work for me, Summerhill, where I am from, it's brilliant. They will all be enjoying it. "From the last home, I was nervous again. He was travelling so well. He is named well - he is a tiger and he wants to win. As everyone knows, I don't get too upset too often. I am a little emotional today but, for my whole yard and for everyone, this is what it is all about and you dream about this. "To win three Grand Nationals. Gigginstown, Michael, Anita and Eddie, Wendy and Mags, who buy all the horses, Joe at home on the farm and everyone connected with the whole place. I am forgetting people, the vets, my own vet Eduardo and the team and Gerry Kelly - we all work together with this horse. I don't wasn't to sound like I am being patronising but it is unbelievable. "There was no pressure. Pressure doesn't really get to me and I had 11 runners in the race and, if anyone of them had won, I would have been very happy and delighted. But for Tiger to win, it's a bit emotional. He is a star and I can't wait to get home to Summerhill and Trim to see everyone."